A stone’s throw southeast of the Kremlin, the Taganka district possesses quite a character quite distinct from that of the city centre. Hilly and sprawled haphazardly between the Moskva and Yauza rivers, Taganka is a convergence of bluecollar grit, Russian orthodoxy, and the haunts of intellectualism pooled with political dissidence. It was also the stomping grounds of the Tsar’s elite, who built massive country estates there that are now obscured within a concrete jungle. This complex mood is perfectly preserved in Taganka’s walls. A turn off its busy main streets and one can amble along for hours in hushed alleys of architectural curiosities, an impressive mixing of Soviet grandiosity and the hallmarks of the Russian church. Flanked by massive monasteries, such as the 14th century Andronikov and Novospasskiy, the district gave birth to craftsmen and merchants who later populated Taganskaya square. The 20th century transformed Taganka into one of Moscow’s largest industrial areas. The neighborhood is also dominated by Stalin’s first of the “Seven Sister” buildings—the massive apartment house on Kotelnicheskaya Naberezhnaya. While the Taganka district is extensive, the below highlights are all walkable from the Taganskaya metro station. Taganskaya square’s chaotic traffic web of 8 major roads and the Garden Ring is dominated by the Taganskaya Metro station. Arriving by way of the Circle Line, one is greeted to a lavish display of post-war worship of Soviet military might. Opened in 1950, the station is embellished with nearly 50 powder-blue Majolica panels dedicated to the Soviet Air Force, Army and Navy; each panel showcases a particular grouping, such as artillery. The station’s escalator ascent and descent were split into two portions during construction to preserve a nearby building and in view of the fact that the station was built on a hill. Instead of a straight shot up or down, one traverses a short passage adorned with a beautifully frescoed dome. Upon exiting the Circle Line station, look left for a view of the pretty St. Nikolas church on Bolvanovke, built in the early 1700s. While the interior is unimpressive, the blood-red exterior and earthy green onion domes transform into an eerie specter at dark. Across the street from the station at the corner of Verchnaya Radishevskaya and Zemlyanoy Val is the renowned Taganka Theatre. Founded in 1964 by Yuri Lyubimov, the theatre was extremely popular for its subtly subversive criticisms of the Soviet system; though censured, it was never closed. The productions and memorable acting talent of Vladimir Vysotsky and others drew an almost cult-like following. Soviet authorities also held it up to the West as an example of cultural freedom in the USSR. Lyubimov focused on so-termed “epic theatre”, incorporating music, acrobatics and dance, and often staging scenes off-stage, in the audience or in the lobby. Popular but controversial plays were shown, such as The House on the Embankment, Boris Pasternak’s Doctor Zhivago and Mikhail Bulgakov’s Master and Margarita, which remains on the theatre’s repertoire. (For further background on Bulgakov’s Master and Margarita, see PASSPORT’s December 2010 issue). Lyubimov’s productions were regularly banned by Soviet authorities. The situation intensified in 1984; while traveling abroad, Lyubimov was stripped of his Soviet citizenship and forcibly exiled. Communist Party-friendly alternates were brought in to replace Lyubimov, but were boycotted by the troupe and theatre-goers, at least initially. When in 1989 Lyubimov made an illustrious return to run the theatre, the troupe split, dealing a serious blow to the theatre. Though Lyubimov remains at the helm (at age 93), the theatre has never recovered its famed status. This is also arguably due to the entrance of glasnost; the theatre had made its mark by censuring the censors. Taganka, night full of fire. Taganka, why have they ruined me? A pleasant architectural walk begins at Goncharnaya Street, tucked behind Taganskaya Metro station, and ending at the Church of St. Nikita Beyond the Yauza and the Stalinist “Sister” apartment house on Kotelnicheskaya Naberezhnaya. Potters’ Street, Goncharnaya, begins like a calming whisper after Taganskaya square’s frenzy. One of Moscow’s older streets, in the 16th century it was lined with pottery manufacturers. The fire of 1812 destroyed much of the original architecture, but later 19th century buildings and Soviet-era construction provide an interesting mix. At No 36/38 is a massive WWII-era residential building that previously housed a defense commissariat. Reportedly finished by German POWs, the building sports Corinthian columns, a soaring archway, a shock of royal blue at top, and lofty statues dedicated to peace. Further along, at No 29, is the lovely 17th century Potters’ Church of the Assumption, built in 1654. The charming tilework and starry gold and blue domes grab the attention of passers-by. The bell tower was added in 1790. Adjacent, at No 26, is a colossal building home to military scientists during the Soviet period. The contrasting lower and upper stories are particularly unusual; the lower stories a row of high decorative arches while the upper boasts bay windows. Goncharnaya street boasts several immense country estates originally belonging the Tsarist elite. No 18 was built during the 18th and 19th centuries. No 16/14 is an expansive 19th century estate built on 17th century foundations. The 19th century estate at No 12 has been “remonted” several times, with a northern wing added in the early 1900s. At No 7, this 19th century faded beauty bears the intricate fretwork and ornately carved shutters of classic Russian wooden homes of yesteryear. 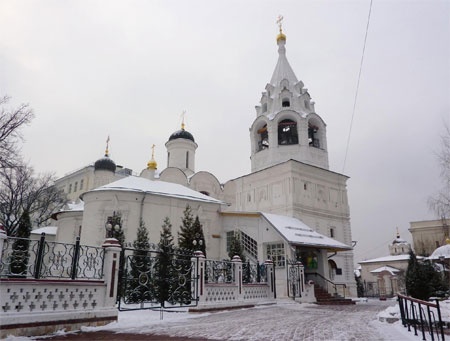 At No 6, the snow-white Church of St. Nikita Beyond the Yauza, features additions from multiple centuries, beginning with foundations dating from the 1500s. The exterior walls are 16th century, while the inner chapel is 17th century. A bell tower was added in the 18th century. 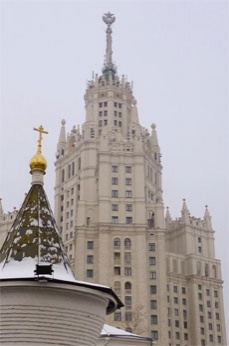 The street’s grand dame, however, is the dominating gothic- style Kotelnicheskaya apartment block—the first of Stalin‘s Seven Sisters—located at the junction of the Moskva and Yauza rivers. Originally built to house Communist Party elite, the well-built apartment buildings featured hardwood floors, marble, and breathtaking views of the Kremlin. 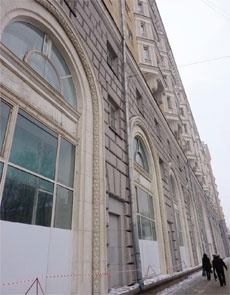 The apartment block also housed a movie theatre that was the only cinema, in Soviet times, to feature undubbed foreign films. Just over 1 km northeast of Taganskaya square is the Andronikov Monastery, an important site of the Old Believers. Dating from 1360 and founded by Metropolitan Aleksey, this striking monastery on the banks of the Yauza river is named after its first abbot, Andronikus, though is also known for its most famous monk, legendary icon artist Andrei Rublev. Rublev lived at the monastery and is believed to have been buried here upon his death in 1430; the location of Rublev’s grave is unknown. While the monastery houses an icon museum dedicated to Rublev, none of his icons are actually here, but are preserved at the Tretyakov Gallery. However, one can get a glimpse of his work inside the gentle single-domed Cathedral of the Saviour. Built in the late 1300s, it is Moscow’s oldest stone building. After the Bolshevik revolution, the monastery was used as a prison camp. It was actually scheduled for demolition, but Khrushchev’s “thaw” allowed this sacred site to remain. In 1960, it formally opened as the Rublev Museum. Roughly 1 km south of Taganskaya metro station is the marvelous Novospassky Monastery, which was initially located on the Kremlin grounds in the 1300s before being moved to its current location. Magnificent exterior walls guard inner treasures, including a stunning 5-domed frescoed church built in the mid-1600s. The monastery’s original buildings, however, had no such protection and were destroyed during the Tatar invasion. Like the Andronikov Monastery, it was used as a prison camp during the Soviet era before being returned to the church in 1991. Today’s setting is subdued and tranquil; despite claims that Novospassky is Moscow’s oldest monastery, it attracts fewer tourists than one might expect. Another draw is the monastery’s superb male choir, recognized throughout Russia.